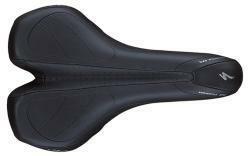 This is a saddle with a V-groove design body geometry to improve comfort and reduce perineal pressure. It has a synthetic cover over generous amounts of soft durometer foam padding to ensure comfort. It also has steel rails, with Zertz rail attachments for vibration damping and E.S.T. for flexible shell comfort. It is available in 2 widths, 155mm and 175mm.